For a taste of the tropics in a healthy smoothie recipe that's perfect for breakfast or a snack, everyone can enjoy sipping on these. For a taste of the tropics in a healthy smoothie recipe that’s perfect for breakfast or a snack, everyone can enjoy sipping on these Mango Lava Flow Smoothies. As you may remember, The Hubby and I went on a weeklong cruise for our tenth anniversary. It was our first cruise, so everything was a new and exciting experience for us. We enjoyed a week of relaxation, good food, excellent drinks, lounging by the pool, exploring new tropical locations, and just having fun together. Without our kids. So naturally what did we do? The big one would have a blast doing this and the little one would love that. Do we want to go on a smaller ship or a bigger ship? Would we stick with the buffet or take them to the main dining room a few times? We totally have to take the little foodies to the main dining room, though I am sure they will love the endless taco bars and chicken tenders and french fries and, yes, even the fruit. Should we let them sleep in fold out bunk beds or just splurge on the adjoining rooms? Should we wait a few years or go soon? I know, I know, it’s like breaking one of the cardinal rules for a kid-free vacation. But we just couldn’t help it. We know they will love it as much as we did. 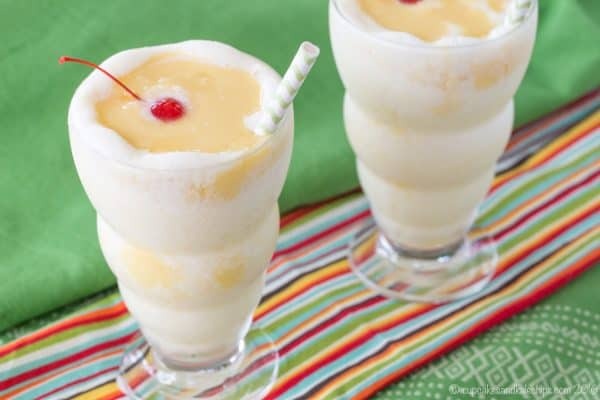 Mango Lava Flow Smoothies are a fun and healthy version of the lava flow frozen cocktail. While usually made with strawberry puree, The Hubby and I became partial to the mango version on our cruise. 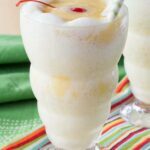 This fruity puree is swirled with the classic frozen pina colada for a fruity, creamy, decadent drink. However, between the rum and the sugar, it’s definitely not an everyday treat or one to share with the kiddos (though they did make them alcohol-free on the ship). So I decided to make one I could enjoy on a regular basis, and share with my kids because it’s packed with frozen fruit from Dole Packaged Foods. 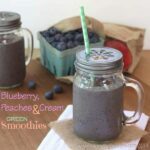 While it looks all fancy, this is really a simple smoothie to make, and even more fun to serve and enjoy. You start with a simple mango puree that’s nothing more than Dole Frozen Mango Chunks and coconut milk, and set that aside in a small pitcher or measuring cup (unless you are like me and have several blender jars, in which case just pull out another). 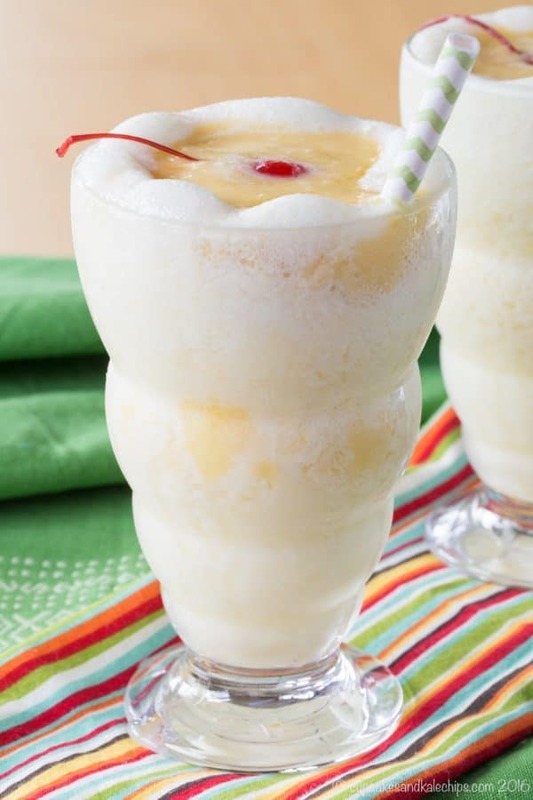 Then it’s just a combination of Dole Frozen Pineapple Chunks, coconut milk, Greek yogurt, and ice for the pina colada smoothie. If you really want to amp up that coconut flavor or give it more of a nod to the original cocktail, you can add coconut or rum extracts (or both), and sweeten to taste. Then just layer and swirl in a couple of glasses! 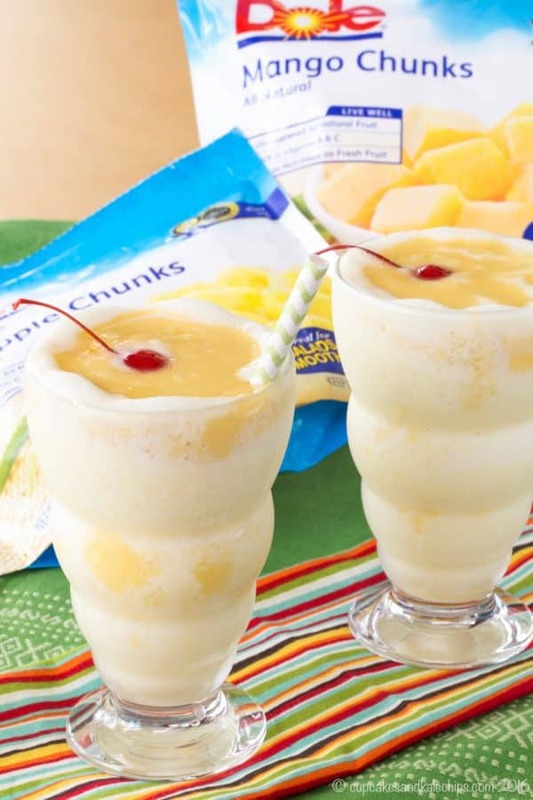 While it may be the start of a new school year, since Dole frozen fruits are in season all year round, you can still be dreaming about tropical island vacations while sipping on these Mango Lava Flow Smoothies. Combine the mango and coconut milk in a blender and puree until smooth. Set aside in the blender if you have a second blender jar or in a pitcher or measuring cup. 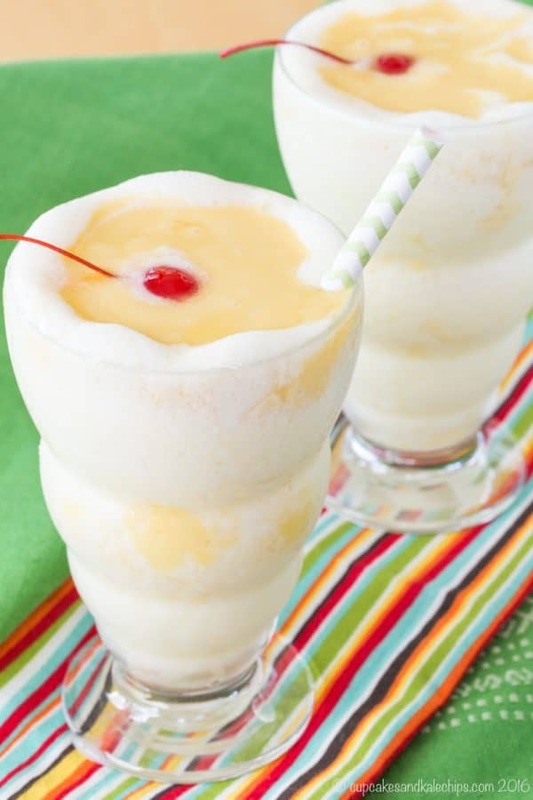 Combine the pineapple, yogurt, coconut milk, and ice in a blender and puree until smooth. Add optional extracts if you want more coconut flavor or more authentic pina colada flavor with the rum extract, as well as sweetener, if desired, and blend for another couple seconds to mix. Pour a small amount of the mango puree in each of two glasses. 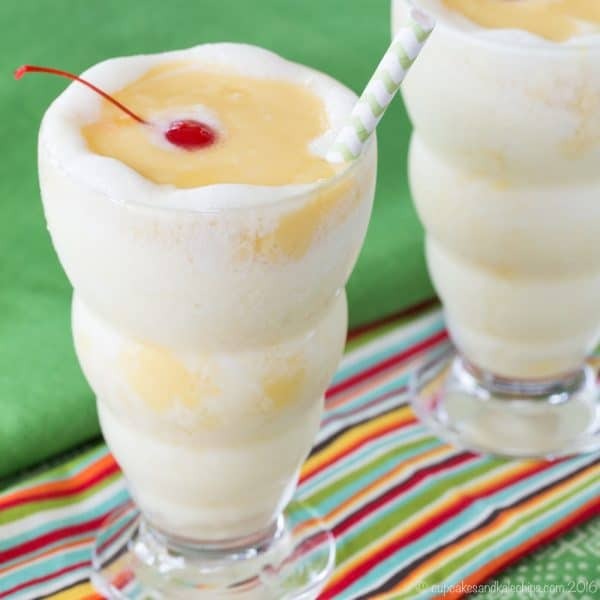 Top each with about a quarter of the pina colada smoothie and a little more mango puree. 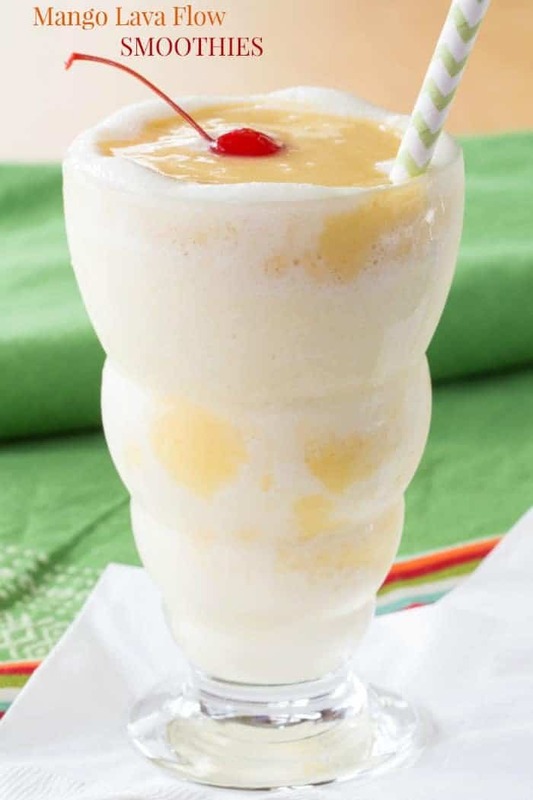 Pour half of the remaining pina colada smoothie in each glass and top with the remaining mango puree. Garnish with a cherry, if desired. 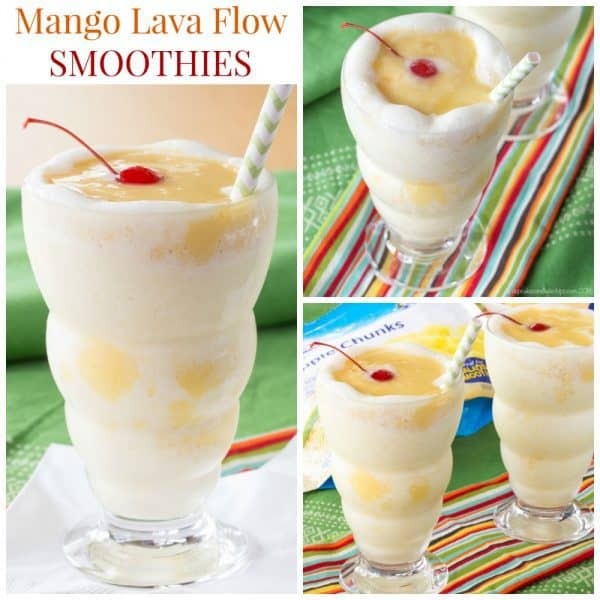 Enjoy this Mango Lava Flow Smoothies recipe! This looks like a delicious drink to make. I personally love Dole products quite a lot. Both of these sounds delicious. My youngest would go for the mango and my oldest daughter would love the pina colada. Thanks for sharing these on Merry Monday. Pinned. These sound delicious – and they look so pretty! This smoothie sounds like a vacation! Can’t wait to try it! Gorgeous! Makes me want to head straight to the beach. We’re heading on a Mediterranean Cruise next week, and I CAN NOT WAIT! I’m still not sure how you got the white layer to be all around the outside– but regardless, it looks like a healthy treat that your kids ought to love, on a cruise or at home! I just went back and fort a couple times. Pour in some mango, pour in some coconut, pour in some mango, pour in some coconut. If you pour gently, it kind of swirls like that instead of mixing. Yum! This looks awesome! 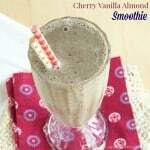 My boys would love this – I’ll add it to my arsenal of smoothie recipes for the kids! Okay, these are just the coolest smoothies ever. I love the flavour in these, plus they are so darn pretty. Love Dole products, I always keep the kitchen stocked in case of a fruit emergency. Which seems to happen daily. We do the same thing, we go away and end up talking about the kids. But at least your view was stellar while you talked about them. I am SO glad to hear that “fruit emergencies” are a real thing, Kim, because we have them a lot! Thanks for the comment. You gotta have fruit in the freezer for those after school smoothie emergencies! Exactly, Heidi. Lord help us if the smoothies aren’t happening after school. These look soooooo creamy and delicious! I will definitely be making this!! Oh, my. I want one of these smoothies … now! LOVE this! Brianne, that is gorgeous! I want to be drinking one of those this very minute!